Jewelry isn’t all about the girls. Men like jewelry too. Among the emerging trends in the men’s market is that designers, who have catered expressly to a female clientele, have expanded into mens’ jewelry. 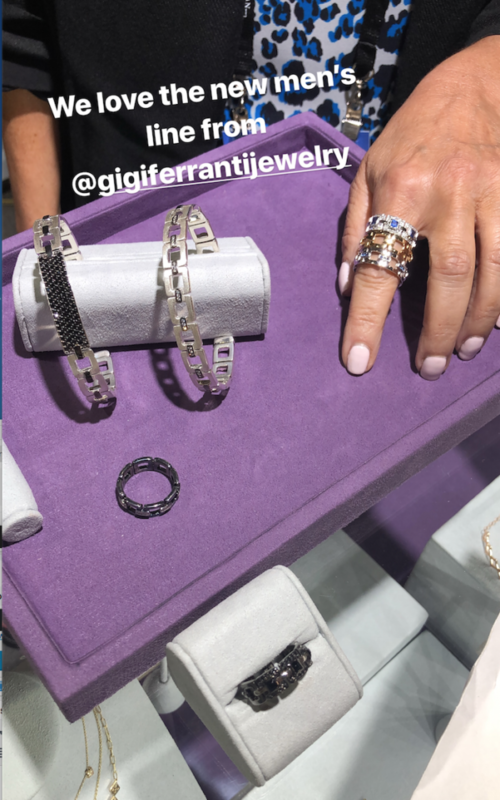 For example, New York-based designer Gigi Ferranti recently introduced Marchello, her new collection of rings, bracelets, cufflinks and crosses for men. 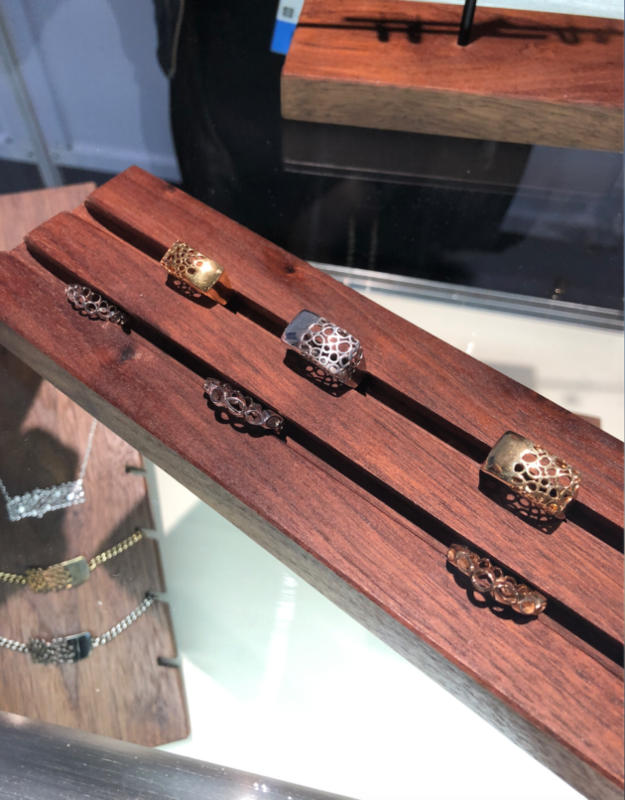 She told us she saw a need in the market for fine fashion jewelry for men’s wedding bands as well as fun jewelry for men and that she wanted to create pieces that appealed to both hetero and gay men—and even have crossover appeal to women looking for bolder statement pieces. She’s already got orders for her Marchello stacked-look gemstone bands from both sexes—and we can see why. According to industry sources and designers we’ve spoken to, some men want a little sparkle. 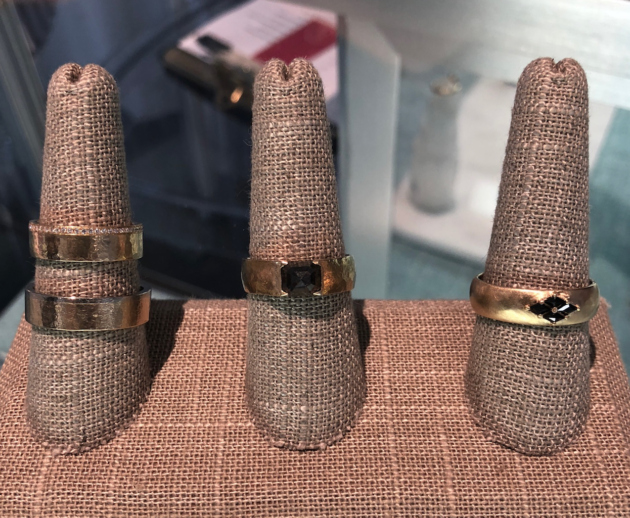 Not necessarily high wattage, but at some recent shows we saw mens rings and bracelets accented with black spinels or black diamonds, which offer the kind of subtle dazzle one could wear every day. More men are opting for a sprinkle of diamonds on their wedding bands too. Not all. We’d say that when it comes to men’s jewelry, there are three types of buyers: the guy who likes a little bling, say in a diamond (black or white) wedding band or pinky ring (which are making a come back along with signet rings); the traditional guy who sticks to gold or platinum and simple styles that can be worn every day—and look good with, say a Rolex; and the edgier guy who goes for something in say, blackened silver. Another designer, branching out into the men’s market is Toronto-based Aimee Kennedy, known for her alternative wedding jewelry. She told us: “We get men who want a little sparkle.” So she created what she calls a “starter sparkler”, a wide band featuring a rose cut back diamond center (shown below). The stone sits low in the band so it’s not likely to catch on anything. Which brings me to another trend point…comfort. Many men are not used to wearing jewelry, so you’re seeing more rings marketed for their “comfort fit”, which means in essence that the ring is crafted so the inside of the band is slightly domed—instead of flat against the skin—to create a comfort fit, which is comfier on the finger and easier to squeeze over a knuckle. Another designer with a toehold in the men’s market is Haejun Parker. We love her women’s collection (sold under the name Hi June Parker), but it was her new take on signet-style rings (shown below) that caught our eye. She told us that when her boyfriend said he wanted a pinky ring, she started creating bold, graphic-shaped rings in shiny gold for men and women, which have been popular with both sexes. The simple gold band has come a long way. Men have many more choices and can now choose bands with more character if they please. By this I mean mixed metals, textured metals, blackened metals, interesting shapes, sculpted designs and diamond and gemstone rings. Typically, men tend to look to their partners for guidance in choosing a band that matches some detail in her ring. But matching bands are not as popular as they once were as more men are becoming comfortable with choosing something that represents them as individuals as well as the marriage bond. In other words, this is also a growing market with many more options than ever before. Bottom line: More designers are seeing an opportunity in men’s jewelry and going for it and marketing to men who don’t want the full-on Johnny Depp or rapper look, but would wear a discreet cuff bracelet or subtle signet ring. Something classy, fashionable and polished looking. And of course, the big branded names in men’s jewelry—David Yurman and John Hardy—are still going strong. Oh, and one last word on cufflinks: yes, they are still around, but have you gone shopping for a French cuff shirt lately? They’re hard to come by. Just click on the David Yurman website for example, and you’ll see that men’s bracelets, necklaces and rings way outnumber the cufflinks shown on the site—which don’t even get their own category; they’re listed under the broader term: accessories.